Garlic Tip #1: If you want to avoid ‘garlic breath’ eat a few leaves of any chlorophyll rich herb like fresh mint, parsley or basil afterwards. 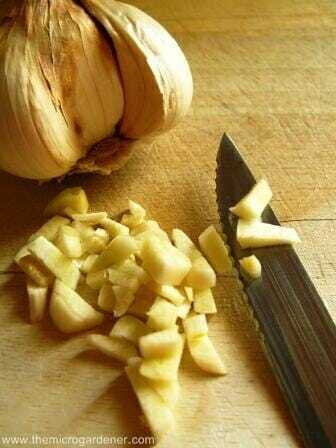 Garlic Tip #2: When using garlic in recipes, 1 clove = 1 teaspoon chopped fresh garlic or ½ teaspoon minced fresh garlic. Garlic Tip #3: The longer you cook garlic, the milder and sweeter the flavour. Garlic Tip #4: There’s an easy way to release garlic skin without fiddly peeling. Lay a clove flat on a board, slice off the root and place under the blade of a wide knife. Press down hard over the top and the skin will pop off. Garlic Tip #5: Adding garlic early in a recipe will result in a milder flavour than adding it towards the end. Garlic Tip #6: In recipes, don’t be tempted to increase the quantity. 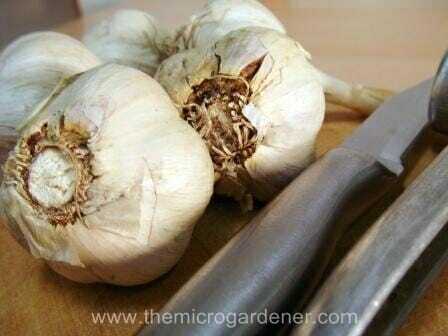 Garlic can overpower other flavours, especially if it’s home grown. Garlic Tip #7: Know how strong your garlic is. Until you’ve tried using it, I suggest less is more. You can always add, but can’t take away! Some varieties have a strong flavour while others are mild. Garlic Tip #8: The finer you chop your garlic, the more intense the flavour. Minced = strong; sliced = milder; whole = mildest. You can control how much flavour to add in the way you prepare your garlic. Garlic Tip #9: If you don’t have any garlic, snipt off a few of the green shoots while it’s still growing in the garden and use as a substitute. You can also use other members of the onion family including garlic chives, chives, spring onions, shallots, leeks or onion tops. Garlic Tip #10: Use garlic leaves the same as you would chives. Snip into stir fries, salads and egg dishes. To intensify sweetness, roast a whole clove in a covered container. Mash into potatoes and gravy (it’s to DIE for)! Garlic Tip #11: Add garlic to oil or vinegar to flavour when adding to dishes or making a dressing. However, make fresh and refrigerate, use or freeze your garlic oil within 10 days to avoid the growth of harmful microorganisms. Garlic Tip #12: Add garlic to flavour your meat – it also helps you digest it. When cooking, avoid burning garlic as it becomes bitter. 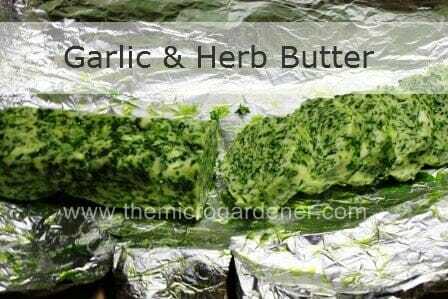 Garlic and Herb Butter. To 4 tblspns butter, add 1 minced clove garlic; 2 tspns chopped fresh (or dried) herbs and a sprinkle of salt. Mix well & spread on bread or pizza bases, melt on vegetables or toss through pasta. Roll any excess into a log between kitchen wrap and freeze. Cut rounds and use as needed. Yummy Garlic Recipes. These include Baked Garlic and Eggplant Salad; Garlic Custard; Ayurvedic Garlic Curry; Garlic Prawns and many more. When Hippocrates said over 2300 years ago “Let your food be your medicine” he no doubt had garlic in mind. There is so much more to garlic. I thoroughly recommend you read ‘How Can I Use Herbs in My Daily Life?‘ to learn how to use garlic to boost your health and wellbeing. Head or chest congestion. To make an inhalant, chop 2 garlic cloves and add to a small bowl with 2 cups boiling water and 1 tblspn apple cider vinegar. Stir vigorously for 10 seconds then cover your head with a towel and inhale the vapours over the bowl. 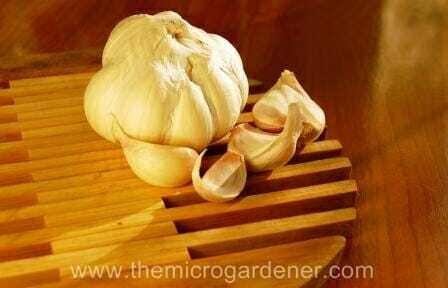 Garlic Health Recipes – make a cold extract, tincture and juice. The sulphur content of garlic acts as a strong disinfectant – rub a raw cut garlic clove on cuts as an antibacterial agent. Garlic Tea Immune Enhancer A well-known immune system strengthener, garlic shines as an antibacterial and antiviral herb for fighting colds, coughs and the flu. Drinking fresh garlic tea sweetened with a little raw honey is one of the best ways to take advantage of garlic’s healing properties to heal what ails you. To make: Peel 2-3 cloves of fresh garlic and lightly crush them with the side of a wide knife blade. Add them to 2 cups of water and bring to a boil. Lower the heat and simmer for another 15 minutes. Strain the garlic and allow the tea to cool to mouth temperature. Add raw honey, a tiny pinch of cayenne pepper and a squeeze of lemon juice. Drink as much as needed. For any pest or disease problem in the garden, I look at the source of the problem and work with nature to avoid it. A quick fix spray remedy, even if it IS organic, is just a bandaid on why the problem is there in the first place. There are consequences for every action and whilst recipes and sprays abound in books and the internet, it’s wise to understand what you are dealing with first. 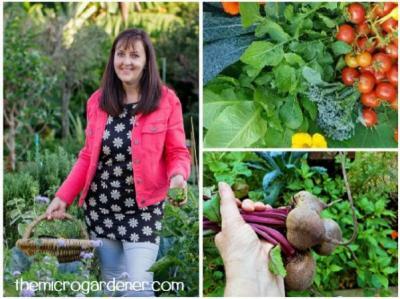 I’ve only ever had to use an organic spray very sparingly on a few occasions in my garden. Only as a last resort strategy to avoid losing a crop. For the most part, I’ve found if I build healthy soil, I don’t have major pest or disease issues. 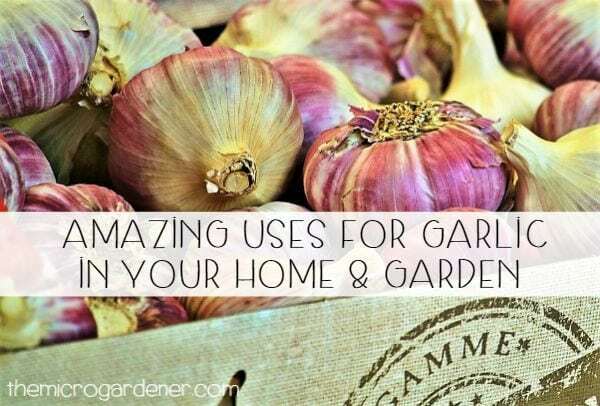 The primary way I use garlic in my garden is as a beneficial companion plant. There are a few exceptions including peas and beans. Interplanting it with other crops can be a useful pest management strategy. Garlic leaves and bulbs have a strong aroma and can help deter both air and soil-borne pests including leaf eaters, spider mites and fruit flies. 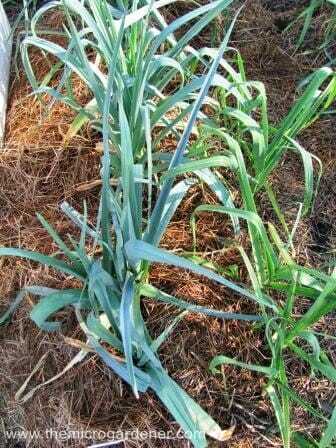 I’ve found garlic is most effective when the leaves are more developed. This is my gorgeous garlic on the right and luscious leeks on the left! 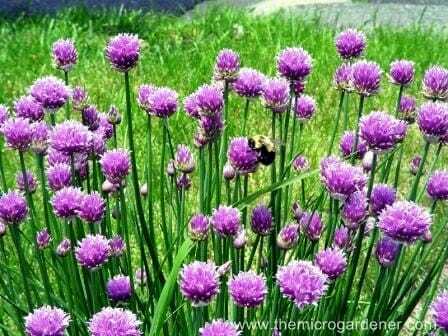 The smell of garlic and other allium family members can help confuse pests. These include carrot flies and white cabbage butterflies by masking the smell of host plants. This is where the mummies want to lay their eggs for their little darlings to hatch out and eat. So, interplant your carrots and brassica crops between garlic, leeks, onions or chives to use this strategy. Interplant with raspberry canes for protection from grubs. Try planting garlic around the base of peach and nectarine trees to reduce curly leaf infection. Plant garlic around roses to improve fragrance and growth. Planted around trees, garlic can deter borers, mites and weevils and is a much safer alternative to harmful chemicals. The active ingredients in garlic include complex organic sulphides. Garlic’s antimicrobial properties means it can be effective against a range of pests and diseases particularly as a fungicide. Its strong scent and flavour make it unpalatable (to insects and some animals) and a natural short-term repellent. This garlic spray works on smell and taste to help deter possums. 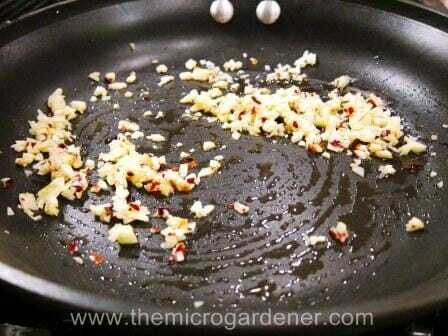 Add 2 tablespoons freshly crushed garlic to 1 litre of hot water (or add 2 tablespoons freshly crushed hot chilli). Allow to stand overnight. Strain. Spray on foliage. Remember sprays are best used in the cool of the day to avoid burning your plants and will only last a few days. Garlic contains high levels of sulphur, an effective fungicide. A few crushed cloves in water (and strained) can be used to make a homemade spray. For effective control, timing is important. Spray at the first sign of powdery mildew and repeat every week or two until it is under control. 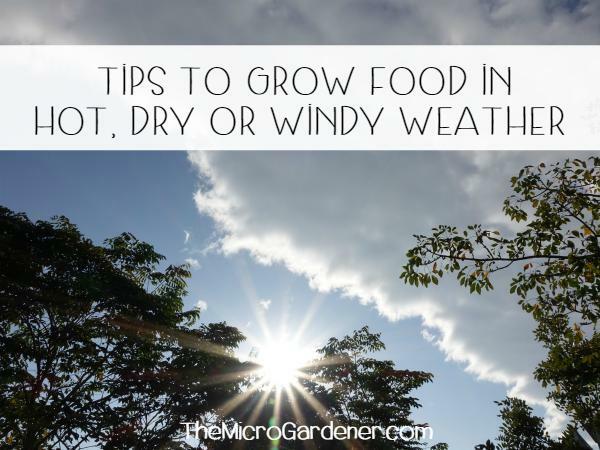 Some squash and melon varieties may be sensitive to garlic so an alternative is to spray upper leaves and undersides weekly with a solution of baking soda (1 tspn baking soda + a few drops liquid soap in about 1 litre of water). Test a few leaves first. Baking soda increases the leaf surface pH – an environment powdery mildew spores won’t grow on. Caution: Garlic spray can be used as a general purpose insecticide and fungicide. 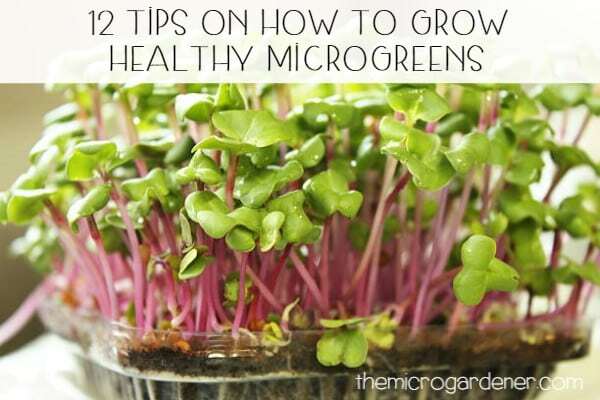 However, be aware it kills your friendly little beneficial insects as well as plant pests and diseases. So use carefully! Please consider other options you have before using any spray even if it is organic. Adding finely chopped garlic to your little ladies’ food and water monthly (during the full moon cycle) is a good natural worm preventative. It also stimulates digestive organs, treats intestinal infections and bacteria Garlic is a wonderful disinfectant, alleviates catarrh and benefits the liver and gall bladder. Your chooks will thank you! 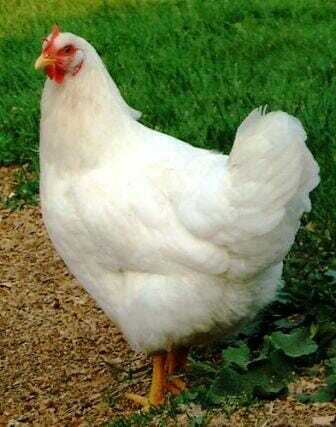 Prevent Poultry Parasites: Add garlic to chook food to prevent and control parasite infestations. If you missed Part 1 – 5 Step Guide to Growing Gorgeous Garlic, then check it out – you’ll learn just how easy it is to grow this flavoursome, medicinal and versatile herb. You might also enjoy Guide to Growing Spring Onions – both indoors and out! This article is for information purposes only. Please do your own research and consult a health care practitioner. I have been growing some garlic for almost two months now, and it is the first house plant that I have successfully grown ever! A huge winter storm hit and we brought up the temperature by 2 degrees (from 65 to 67) and now they are wilting and dying. I make sure that the soil isn’t dry every day, they are in a south facing window and have plenty of drainage. I am not sure what is wrong, or if I can save them! Usually wilting is a sign of no return for my plants. Could the enhanced white light from all the snow outside be giving them too much sun? Or did that 2 degree temp change do it? Also I was wondering what kind of fertilizer I can use besides fish? A little embarrassing but I have a phobia of fish, would banana’s be okay for garlic? I can’t say for certain what’s caused the change in your garlic. However, garlic always responds well for me when I use liquid seaweed (both in the soil and as a foliar spray on the leaves). If it is stressed for some reason or adapting to the change in environment, this is usually my quick go-to remedy! Remember garlic needs great drainage at all times so make sure you’re not overwatering. Try a moisture meter to take the guesswork out of it if necessary. I use one for all my pots. I’d also suggest a thick layer of mulch if you haven’t already done this. 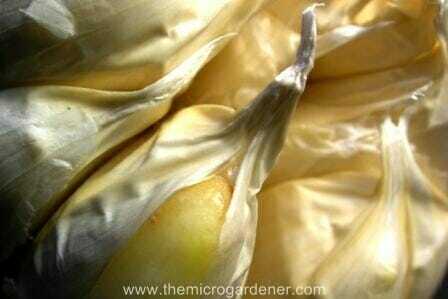 See my post on 5 Steps to Growing Gorgeous Garlic for more tips. Thank you for sharing this information. I have just this morning harvested three soft top garlic’s which are drying in the pantry. Being I am a novice I was waiting and waiting for the garlic to flower not knowing that this variety does not produce a flower. I had 1 garlic where I used to live flower but I left it in the ground because I didn’t know what to do I didn’t think of even looking on the internet for some information. So please could you send me the amazing “Garlic guide” I need all the help I can get and the more information the better. Thanks for your story and comment Wendy. Your Garlic Guide has been sent! Enjoy the read and happy planting and harvesting your gorgeous garlic! Hi. You mentioned dogs eat garlic for worms. I have cats. One has worms and the other has really congested lungs and a cold. I can’t afford a pet doctor. Is it okay to administer garlic to cats, and how do I incorporate it into their food. The taste is different to them. The suggested dose is 1/2 finely chopped or pressed small raw clove mixed into food daily. Aged Extract: 1/2 capsule daily mixed into food. 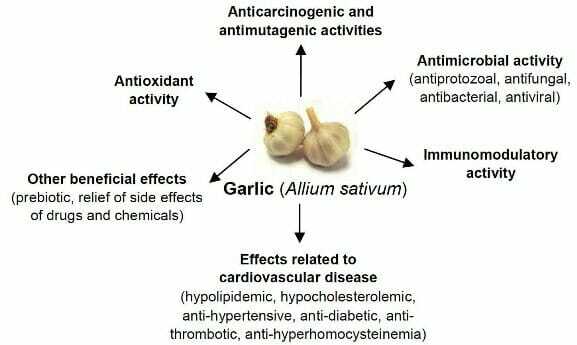 The use of garlic is contraindicated in animals who are anemic. Research indicates that garlic causes a type of anemia in animals, especially in cats, if given in large doses. Even in healthy subjects it is a good idea to dose in moderation. Interplanted lettuces and herbs with garlic today! Great site. Have used Garlic for years but I learned stuff here I did not know. And now I can grow my own. Best. Thanks for stopping by and leaving a comment. Glad you picked up something new … I never stop learning about the amazing qualities of plants, especially edibles ones and their health benefits. One of the reasons I’m addicted to growing my own food and encouraging others to do so! I’ll send you a copy of the Garlic Guide – I’m sure you’ll enjoy even more tips and ways to use it. I love garlic in every form. We eat garlic every day and I don’t think that I could do without garlic. One hint that I would add to the garlic list above is to mince/chop your garlic and let it rest for a bit before you use it. It converts the sulphur in the garlic and makes it better for you. 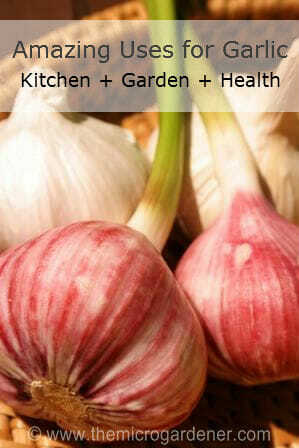 I would love a copy of your garlic ebook thanks Annie and will be sure to make something headily garlic scented ASAP. I really enjoyed reading your newsletter. I am going to start to grow my own garlic too. Hi Delores … fantastic to hear you’re going to grow your own gorgeous garlic. Happy to send your ‘Garlic Guide’ and hope you enjoy it. There’s plenty to tuck into. Initially found you on Pinterest and now get emails as well. Love the creativity. I live in Alaska and have started lots of seeds which I’ll transplant in 4 to 5 weeks to my roof container garden, which is new this year. Planted garlic last fall and will see if they come up. Thanks for all the neat stuff on your site. I read your newsletters regularly & I read with great interest your articles on Garlic. I grew some for the first time ever last year & this year I have repeated. I lived in Spain for many years before returning to the UK in 2001. The Spanish make a great deal of use of Garlic & I grew to appreciate it there. My wife is Spanish & we have continued to use Garlic in many of our meals even here in the UK. I’d love a copy of your Garlic Guide as well. Thanks so much for sharing your experiences with garlic. I love hearing how others are using it and where they’re growing it. I am sure you have different varieties in the UK to what I grow here in Australia but the benefits of this herb are amazing and play a vital in our health. I’d be interested to follow your garlic experiences in the allotment and how you find it as a companion plant if you are using it as one. Your ‘Garlic Guide’ is on the way! Enjoy reading it. Great information about GARLIC. Love the stuff. Keep up with the tips. I don’t know what I would do without garlic! My plan this year is to tuck some bulbs in my other beds to deter pests. I’d love a copy of the Garlic Guide too! I have some bulbs already started, so the more information the better!! Some really helpful information thanks so much! Can’t wait to get my garlic in now! I love garlic, but have never tried growing it myself. After reading this, I will never buy it from the store again! Thanks for all the great info! I truly enjoy reading your posts; the garlic posts are near and dear to me because not only do I love growing my own but I put almost every thing you mentioned in to play here on our little hobby farm…. we have a little of every animal Noah had, lol…. and we treat them all with natural preventatives as much as possible. Keep up the good work and have a blessed growing season. Thanks so much for your inspiring comment and lovely feedback. Do you have a blog? Would love to see your hobby farm and what you’re up to .. it sounds ideal and so glad to hear you are treating your animals naturally. Great example to others. I must admit I feed our three dogs with the same organic and natural diet we have and they are so healthy and happy.